Steph Houghton curled in a low free kick to score England's first. It was a rematch of last year's final as Steph Houghton and Nikita Parris score for England in their draw against current champions USA. The Manchester City pair scored two brilliant goals for the Lionesses in Nashville, Tennesee in the USA. USA opened the scoring when Megan Rapinoe controlled the ball with her chest and volleyed it into the top corner, well out of the reach of England goalkeeper Karen Bardsley. Manchester City's Steph Houghton curled in an equaliser from an indirect free kick. England then took the lead when Fran Kirby passed an accurate through ball through to Nikita Parris to score. 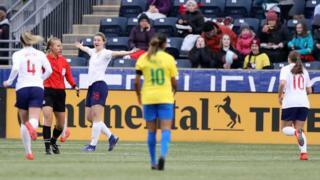 After a scramble in the penalty box, England failed to clear the ball and USA's Tobin Heath scored from close range to make the full-time score 2-2. It's all to play for going into Tuesday's final group games, as England face Japan, who are top of the table. Last year England lost out, with the USA being crowed the 2018 winners. But could 2019 be England's year? Previously it brought together the top four sides in the Fifa world rankings - USA, Germany, France and England - but, this year, 2011 World Cup winners Japan, and Brazil who are 10th in the rankings, will compete for the trophy. The USA are defending champions and two-time winners. France are the only other side to have lifted the trophy. Ellen White of England celebrates after scoring her sides first goal during the match in Chester, Pennsylvania. 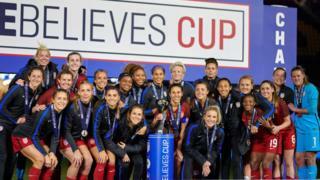 England's manager Phil Neville has said that even though the SheBelieves Cup is an invitational event, the results are crucial with the Women's World Cup only three months away. If England can come out with a good result against Japan, then it should give them confidence, with both countries in their group for France 2019. You can watch England v Japan on BBC Four at 22:00 GMT on Tuesday. Who will win Women's Footballer of the Year?